• Slimmest design—no loose shroud—totally enclosed. • Reaction arm/pad ready with 2 pin holes. • Patented reaction pawl can be easily disengaged with screw. • Easily connects to X Driver…no pins…snaps in. • Deepest reach on the market… fits all flanges—See datasheet. • Unique reaction pawl position keeps B dimension constant on all sizes unlike the competition. See datasheet. The A Drive is the hex link that the power head locks into, allowing it to fit onto hex nuts in low profile applications like well heads and BOP’s. The A Drive has a larger reaction area. There are no roll pins, just screws. Taking apart the drive for repair is simple—there’s no need to pry it apart like other hex links. All the screws are the same hex wrench with uniform screws in all sizes of the drives. 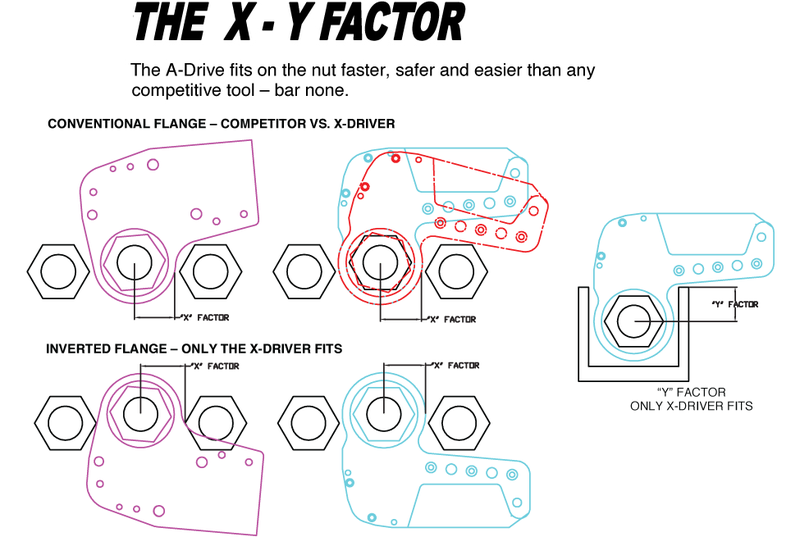 A time tested, three-part design, the A Drive only consists of the drive pawl, the ratchet and the drive gear. Other hex links have many moving parts, increasing breakdowns and complex repairs. The A Drive is more than simple. It’s fast. 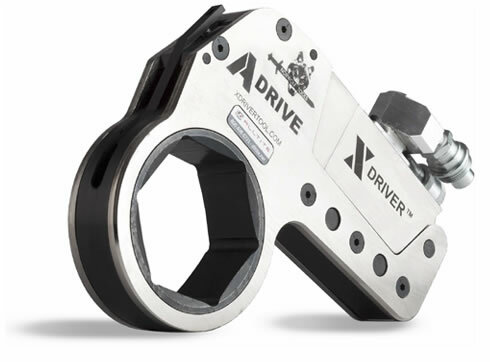 Upon testing, the A Drive is 10-50 percent faster than other hydraulic wrenches. The A Drive has an optional holding pawl. With it, hands-free operation is possible, without it an “anti-lock” feature is possible.